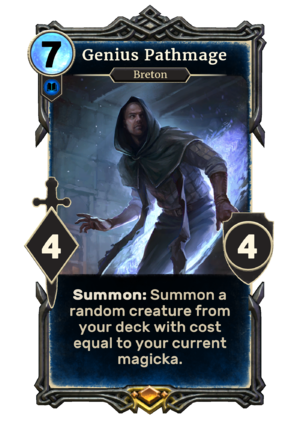 Summon: Summon a random creature from your deck with cost equal to your current magicka. Genius Pathmage is a legendary Intelligence creature card. It is part of the Houses of Morrowind expansion. "Seems I must stoop to their level." This page was last modified on 14 February 2019, at 01:19.